AbstractCurves is an image generator to create stunning wallpapers or posters. 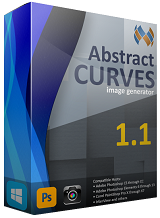 Abstract Curves 1.190 was available as a giveaway on February 8, 2017! AbstractCurves is an image generator which allows you to create stunning wallpapers/backgrounds or posters in any resolution, or add effects or logos/watermarks to your photos. AbstractCurves includes a variety of built-in presets, and gives you the ability to create user presets. This program is available as a standalone application, and as a plug-in to the most popular graphic hosts, such as Adobe Photoshop, Adobe Photoshop Elements, Corel Paint Shop Pro, IrfanView, and others which support .8bf files. Transparent background option for creating logos, icons, avatars, etc. How would you improve Abstract Curves 1.190? I'd like to see a lot of randomize buttons on the different settings! Thank you GOTD & AbstractCurves for this offer. very smooth in running the s/w on my pc. i am new to this type of image tool, need time to learn. i am willing to try on this new toy. anyway i thumb up for this impressive s/w. I still get the "Failed to connect" error whenever I use your software wrapper but I've never received any helpful response which addresses the problem itself. I don't know why I even try. Thanks anyway. This is a innovation tool it's made to open your mind into ideas on what you can generate and build upon.. I for one did my homework and saw all the files in the appdata folder and well in my case I have this lovely tool working flawlessly with open source tools such as inkscape. Ya I'd love a 24 fps loop of the effects on auto but I don't need it I can easy make a macro that clicks up 1 and save with a counter name and save those images as a avi, mpg or what ever video format I want. Activation issues 10 to 1 your not in admin mode to even save your settings under your program files. Seriously love this program since it showed up on the market on day 1. HOWEVER it's not for everyone as for gradients it's mostly xml code so save your preset do a google search and add it yourself. Heck I'm actually pissed off that they wanted to do another GAOTD I would of made this a contest draw and get some serious feedback. The makers of Abstract Curves know how to code as all their sources are in proper form but let's face it the closest thing this comes near is texturemaker and filter forge, do they have a market... YES I would say as their product is repeatable. All the best to them in 2017. This is a innovation tool it's made to open your mind into ideas on what you can generate and build upon.. I for one did my homework and saw all the files in the appdata folder and well in my case I have this lovely tool working flawlessly with open source tools such as inkscape. Ya I'd love a 24 fps loop of the effects on auto but I don't need it I can easy make a macro that clicks up 1 and save with a counter name and save those images as a avi, mpg or what ever video format I want. Activation issues 10 to 1 your not in admin mode to even save your settings under your program files. Seriously love this program since it showed up on the market on day 1. HOWEVER it's not for everyone as for gradients it's mostly xml code so save your preset do a google search and add it yourself. Heck I'm actually pissed off that they wanted to do another GAOTD I would of made this a contest draw and get some serious feedback. The makers of Abstract Curves know how to code as all their sources are in proper form but let's face it the closest thing this comes near is texturemaker and filter forge, do they have a market... YES I would say as their product is repeatable. All the best to them in 2017. There needs to be a whole new group of parameters to define gradients which don't exist because the program lacks that facility so even if we create additional parameters the program will simply ignore them. You also say "The makers of Abstract Curves know how to code as all their sources are in proper form "
Where are the program source files you think are in proper form? I was not aware Abstract Curves was an open source product... please do reveal your source to their source code! Shawn Dion, you say "as for gradients it's mostly xml code so save your preset do a google search and add it yourself." Do you think XML as used by this program is a programming language? It's a structured configuration file and that is all basically a glorified .INI or .cfg file. There are no XML variables to define a gradient, just solid background colour or not and transparent background settings key="1" parameter key="4" Background Color = (222,184,135,255) parameter key="7" Colorize background = 1 parameter key="8" Transparent background = 0 There needs to be a whole new group of parameters to define gradients which don't exist because the program lacks that facility so even if we create additional parameters the program will simply ignore them. You also say "The makers of Abstract Curves know how to code as all their sources are in proper form " Where are the program source files you think are in proper form? I was not aware Abstract Curves was an open source product... please do reveal your source to their source code! Downloaded and installed to a drive other than C (default). Activated per readme instructions and software stays in demo mode. Extracted Activate zip file and ran it that way. The 1/25/17 dated file ran but came up with a error that the activation period was over. Tried running the zip file again, re-booted, and still in demo mode. Guessing it might be a problem not accepting the default installation location but that isn't an option for me. I dedicate a different hard drive for my programs and reserve C for the system. Anyway, a lot to go through for no results. Looked forward to trying with so many folks saying they ended up purchasing. Will end up uninstalling the demo with no chance of purchase if I can't resolve. Hello everyone! I downloaded, installed and activated this application on my Windows 10 Pro. desktop and had ZERO problems. From the initial review I completed with the software I am very happy. It seems to have everything I can possibly need. I'm relatively new to some software so I am in a long learning curve. I have one question to ask, if it is permissible on this forum ... "Can this software be used with Cyberink Photodirector 7 and if so what files do I need to place in the plugin folder of Photodirector?" Thank You GOTD and thank you folks for the comments. I learn more everyday I read them. Hello everyone! I downloaded, installed and activated this application on my Windows 10 Pro. desktop and had ZERO problems. From the initial review I completed with the software I am very happy. It seems to have everything I can possibly need. I'm relatively new to some software so I am in a long learning curve. I have one question to ask, if it is permissible on this forum ... "Can this software be used with Cyberink Photodirector 7 and if so what files do I need to place in the plugin folder of Photodirector?" Thank You GOTD and thank you folks for the comments. I learn more everyday I read them. Stuck in Demo Mode,failed to Activate ?? Contact Customer Support@ AbstractCurves.Got a response in 20 minutes.Now have Registered Copy of Abstract Curves. Cute. I used it for a while for random wallpapers, but got bored of it all and uninstalled. YMMV. I grabbed this wonderful program last time around also and played with it. And yes, the time flies by as you get engrossed in trying out the various settings to see how they affect the image. I created a great Desktop background which I had been wanting for a long time. I've never had any trouble with installing or using it. This is definitely one of those nifty, unique programs that come in handy. It's a definite keeper! Have contacted support at Abtract Curves, regarding Activate.exe failure,awaiting a reply. Refuses to activate,even after running Activate.exe as Administrator.Please help. Had a demo 1.19 (64-bit) installed,previously,because I missed the giveaway,and this sounded like interesting software to generate images with.Uninstalled demo version,using Iobit uninstaller,also deleting 3 registry keys that Iobit found after running Iobit "Powerful uninstall / search for leftovers".Todays 64-bit installed,but refuses to activate after trying repeated times,using activate.exe,activate.gcd ,closing program,re-opening program,etc.Ran setup.exe FIRST,as instructed to do so in 'readme'.It would appear,based on comments here today, I am NOT the only person having problems with Activation.Usually I can negotiate all the flaming hoops required for activation,even the most labrynthine,but this one has me stumped,stymied,and stalled.Help ??? ?Would LOVE to try the program,fully activated,but CANNOT get it past Demo Mode.Please help.Am considering trying to run as Admin.,but because of the fact that this is a archived (compressed) program,not all methods will give you that option. I would love to use this as an 8bf filter in both IrfanView and Corel's PSP (I have both), but it is not showing up in either as an 8bf filter. Does anyone know how to install the 8bf filters into Irfan and PSP? I would love to use this as an 8bf filter in both IrfanView and Corel's PSP (I have both), but it is not showing up in either as an 8bf filter. Does anyone know how to install the 8bf filters into Irfan and PSP? during installation you can add "hosts". Terry, during installation you can add "hosts". Goto File=>Preferences=>File Locations =>Plug-ins. It shows default directory for plugins. I am running Windows 10 64 bit, installed 64 bit version, ran activate afterwards as administrator (as a precaution), and when I first ran the program, it showed 'Registered to Giveaway of the Day' - did not have to disable antivirus etc. Do give it a try. I downloaded this to see what it could do out of curiosity and I just realized that I have been playing with it for about an hour! I'm not exactly sure what I am going to use it for yet, probably to make some wallpapers, or backgrounds for my site. Thanks, GOTD, this is a nice little program! Thank you GOTD for this offer. Last time I got it from GOTD (version1.190) after installation I bought it. It is a very handy tool which help me in designing. At first the interface look too crowded but after some time we get use to it. I could save transparent image in various sizes. I can also use it in Photoshop. I can save my own presets and could use them in new design. Finally customer support is good and they very cooperative. Thank you GOTD for this offer. Last time I got it from GOTD (version1.190) after installation I bought it. It is a very handy tool which help me in designing. At first the interface look too crowded but after some time we get use to it. In the software I like the most: I could save transparent image in various sizes. I can also use it in Photoshop. I can save my own presets and could use them in new design. Finally customer support is good and they very cooperative. Still in demo mode, tried activating multiple times..
zajozor, I could not activate it either. I dunno, but it seems to me that programs like GIMP, Paint.Net, Chasys Draw, and others, are much more flexible for not only creating graphics, but also wallpapers. While programs like Irfanview may not be as flexible for making graphics it is an excellent program for making wallpapers. I will give this offering a shot, but based on the little I've read and the screen shots it seems this is great for doing abstract graphics, but to me swirling, swizzley lines is not wallpaper. Just me. I dunno, but it seems to me that programs like GIMP, Paint.Net, Chasys Draw, and others, are much more flexible for not only creating graphics, but also wallpapers. While programs like Irfanview may not be as flexible for making graphics it is an excellent program for making wallpapers. I will give this offering a shot, but based on the little I've read and the screen shots it seems this is great for doing abstract graphics, but to me swirling, swizzley lines is not wallpaper. Just me. How about as a background for your wallpaper? The possibilities are endless. JonE, How about as a background for your wallpaper? The possibilities are endless. Nigel, Have to admit I never thought of that; not a bad idea. I downloaded it, but haven't installed it yet, so I'll know more later. I have a couple of great wallpapers made with this program combined with a couple of other programs. It takes time, so I don't do it often, but this program creates the background, another cuts out the main subject from a photograph in an oval shape say (or any shape) and in my case of my dog. Then a third program adds the cutout to the centre of the background. Multiple cut outs could be added of similar or different sizes, but one oval centre one does me. As I say, it's time consuming, but worth it for something you're staring at on a daily basis. JonE, I have a couple of great wallpapers made with this program combined with a couple of other programs. It takes time, so I don't do it often, but this program creates the background, another cuts out the main subject from a photograph in an oval shape say (or any shape) and in my case of my dog. Then a third program adds the cutout to the centre of the background. Multiple cut outs could be added of similar or different sizes, but one oval centre one does me. As I say, it's time consuming, but worth it for something you're staring at on a daily basis. If we make a twisted a picture that we like how do we send it to the printer? Peter Butler, Save the file - choose the .bmp or jpg option - to your desktop or pictures folder. You can then open it. Still in demo modus and asks for a license key? Is this a full version from Give Away Of The Day or only a demo? Did you extract the folder and run the activate after running setup? You may want to try a restart too. I used to try to skip the extraction but cutting the corners always messed with the activation. Jay Dee, Did you extract the folder and run the activate after running setup? You may want to try a restart too. I used to try to skip the extraction but cutting the corners always messed with the activation. Jay Dee, With programs like this which come with a separate "Activate.exe" file, I've always found it best to make sure NOT to run the program before trying to activate it. That is, DO NOT leave the "Run AbstractCurves" box checked on the last screen of the install program, so the program DOES NOT try to run. If you have the AbstractCurves program open, CLOSE IT - BEFORE trying to activate. THEN run the "Activate.exe" program, and only after it completes, start the AbstractCurves program. Using that strategy, I just successfully activated the download and it comes up as being registered to "Giveaway of the Day". Jay Dee, With programs like this which come with a separate "Activate.exe" file, I've always found it best to make sure NOT to run the program before trying to activate it. That is, DO NOT leave the "Run AbstractCurves" box checked on the last screen of the install program, so the program DOES NOT try to run. If you have the AbstractCurves program open, CLOSE IT - BEFORE trying to activate. THEN run the "Activate.exe" program, and only after it completes, start the AbstractCurves program. Using that strategy, I just successfully activated the download and it comes up as being registered to "Giveaway of the Day". Ootje, thank you again. You add so much to this site by actually trying out the programs and providing examples. I had this from an earlier giveaway, didn't realize it would do transparent backgrounds. With that capability, it's possible to overlay different renderings, colors, etc., or to use a curve like your first example to highlight something in a background. Will NOT activate. Tried everything... Still says Demo . me, did you end the program, run the activate and start the program again? me, as Ootje mentioned, apparently the key to getting the program to activate successfully is to CLOSE Abstract Curves FIRST, and THEN run the "Activate.exe" program. After that completes, you can open Abstract Curves and it should say it's registered to "Giveaway of the Day." I installed this back on 3rd August 2015 and liked it and gave it a thumbs up, only real features I found lacking was the inability to create complex backgrounds like gradients in program. Only single solid colours are possible. And the ability to add extra oscillations. One can work around the former by generating a custom gradient externally and loading it in as an image OR creating it in a host program for the PS plugin and selecting transparent background within the program. Initially this morning I thought great an upgrade to the program and started to get a little enthused.. went looking through their website to look for a version history and found nothing, came back here and saw a comment asking about whats new too... fired up the program and found the about dialog and then I thought oh how dissapointing... I already have 1.1.9.0 from the original giveaway apparently... the file is dated 28th June 2015 14:09 The same last modified date as todays! Still worth a thumbs up to me though. I installed this back on 3rd August 2015 and liked it and gave it a thumbs up, only real features I found lacking was the inability to create complex backgrounds like gradients in program. Only single solid colours are possible. And the ability to add extra oscillations. One can work around the former by generating a custom gradient externally and loading it in as an image OR creating it in a host program for the PS plugin and selecting transparent background within the program. Initially this morning I thought great an upgrade to the program and started to get a little enthused.. went looking through their website to look for a version history and found nothing, came back here and saw a comment asking about whats new too... fired up the program and found the about dialog and then I thought oh how dissapointing... I already have 1.1.9.0 from the original giveaway apparently... the file is dated 28th June 2015 14:09 The same last modified date as todays! https://www.giveawayoftheday.com/abstractcurves-1-1/ Still worth a thumbs up to me though. On 3rd August 2015 was is version 1.179 and not version 1.190!!! Today version 1.190 is dated to 18th July 2015! On 3rd August 2015 was is version 1.179 and not version 1.190!!! Today version 1.190 is dated to 18th July 2015! nibo1978, I suspect I downloaded the installer from their website on the day of the giveaway and got the newer version and as it accepted the activation data from the giveaway I kept with the then current version. The GAOTD bundle I downloaded today SETUP.EXE contains 32bit dated as I wrote, the date you quote is for the 64bit executable and plugin. TK, I post the Dates from the 64bit version! Indeed we had this great GOTD many months ago , I wish they will add option for video, as the curves will move from one settings to the other over a set time. It can be installed but it won't activate ........ even when i run Activate.exe itselfs I tried it several times already even with anti-virus / firewall off. It has all same result .... no activation still in Demo mode.. Any suggestions ???? Hanzo, Guys... CLOSE Abstract Curves if it is open, and THEN run "Activate.exe". Is the plug in for Adobe Photoshop also free? Kim Bork, It does give you the Plugin for Photoshop, BUT when you are installing the software make sure on the screen where it ask you the folder to install it to that you select "ADD HOST" and select the directory you would like the .8bf plugin to install to. Very important! In my case trying to use the plugin I kept getting an error message saying that acplugin64.dll could not be found, after doing some checking I found that it had installed that file to my C:\ area on my hard drive, I just moved it to the directory the plugin was in and it worked fine after that. I installed the 64 bit version, not sure if that makes a difference as to why the acplugin64.dll installed where it did. Hope this helps. Also, you can use any software that supports .8bf's, you don't have to use Photoshop, I use it in Paint.net and this plugin to run .8bf's in Paint.net that you can get here - http://psfilterpdn.codeplex.com/ for Paint.net. Kim Bork, It does give you the Plugin for Photoshop, BUT when you are installing the software make sure on the screen where it ask you the folder to install it to that you select "ADD HOST" and select the directory you would like the .8bf plugin to install to. Very important! In my case trying to use the plugin I kept getting an error message saying that acplugin64.dll could not be found, after doing some checking I found that it had installed that file to my C:\ area on my hard drive, I just moved it to the directory the plugin was in and it worked fine after that. I installed the 64 bit version, not sure if that makes a difference as to why the acplugin64.dll installed where it did. Hope this helps. Also, you can use any software that supports .8bf's, you don't have to use Photoshop, I use it in Paint.net and this plugin to run .8bf's in Paint.net that you can get here - http://psfilterpdn.codeplex.com/ for Paint.net. "... select "ADD HOST" and select the directory you would like the .8bf plugin to install to." I like to store a copy of any P/Shop compatible plugins in the folder along with the app it belongs to. It makes it easier to find & add the plugin when I install a new image editing app or a newer version of one I already have. I've also found that some plugins work with some apps when I copy the plugin file(s) to the proper folder for that app, but others may only work when I put a shortcut to the plugin file(s) in that plugin folder (?). In that 2nd case, adding a shortcut to for example the AbstractCurves\1.1\ folder is quick/easy -- it also makes it easy in image editing apps that let me set which folders the app looks in for plugins. "I installed the 64 bit version, not sure if that makes a difference..."
Because of the plugin I installed both. I have both 32 bit & 64 bit image editing apps, so that way I'm covered. Why use 32 bit image editing &/or graphics apps? In a word, compatibility. I've got a lot of plugins that I've had for years, & those are 32 bit. And some stuff, like the scanner driver for my Brother printer, only works with the 32 bit version of PaintShop Pro. Bob, <i>"... select "ADD HOST" and select the directory you would like the .8bf plugin to install to. 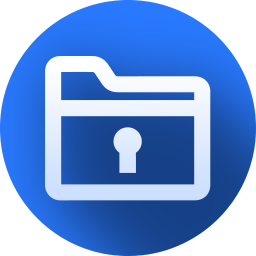 "</i> I like to store a copy of any P/Shop compatible plugins in the folder along with the app it belongs to. It makes it easier to find & add the plugin when I install a new image editing app or a newer version of one I already have. I've also found that some plugins work with some apps when I copy the plugin file(s) to the proper folder for that app, but others may only work when I put a shortcut to the plugin file(s) in that plugin folder (?). In that 2nd case, adding a shortcut to for example the AbstractCurves\1.1\ folder is quick/easy -- it also makes it easy in image editing apps that let me set which folders the app looks in for plugins. <i>"I installed the 64 bit version, not sure if that makes a difference..."</i> Because of the plugin I installed both. I have both 32 bit & 64 bit image editing apps, so that way I'm covered. Why use 32 bit image editing &/or graphics apps? In a word, compatibility. I've got a lot of plugins that I've had for years, & those are 32 bit. And some stuff, like the scanner driver for my Brother printer, only works with the 32 bit version of PaintShop Pro. 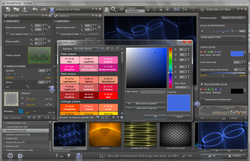 Download a plugin for GIMP called PSPI. This allows for GIMP to run 32-bit Photoshop 8bf plug-ins. Unzip the file into the GIMP install folder (the .zip file has the full file structure to put PSPI into the plug-ins folder. Create a folder someplace to store the plug-in separate from the standard. If you want to run more than one 8bf plug-in, I would suggest separate folders for each one. Run the installer for Abstract Curves and select the 32-bit install. On the screen that asks you where to install the software, click on the "Add Hosts" button in the lower left corner of the window. Then browse to the folder you just created and click "OK". Let everything install. On my system, "acplugin32.dll" actually install to my C: drive's root folder. Move "acplugin32.dll" to the same folder as the 8bf file. 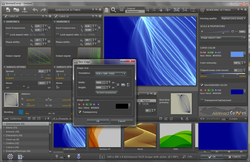 Open GIMP and select "Filters" from the top menu. You will have a new option called "Photoshop Plug-in Settings". Click that and click on the "paper" (i.e. New) icon. Then click on the folder "browse" icon at the far right. Go to the folder you put the Abstract Curves plug-in at and click "Ok". Restart GIMP and either start a new project or open a current project. You will be able to access Abstract Curves from the "Filter" menu options. Bob, This actually worked for me in GIMP x64 version. However, there's a couple extra steps needed to get it working in GIMP. Here's what I did: Download a plugin for GIMP called <a href="http://the-tml.net/gimp/pspi.html">PSPI</a>. 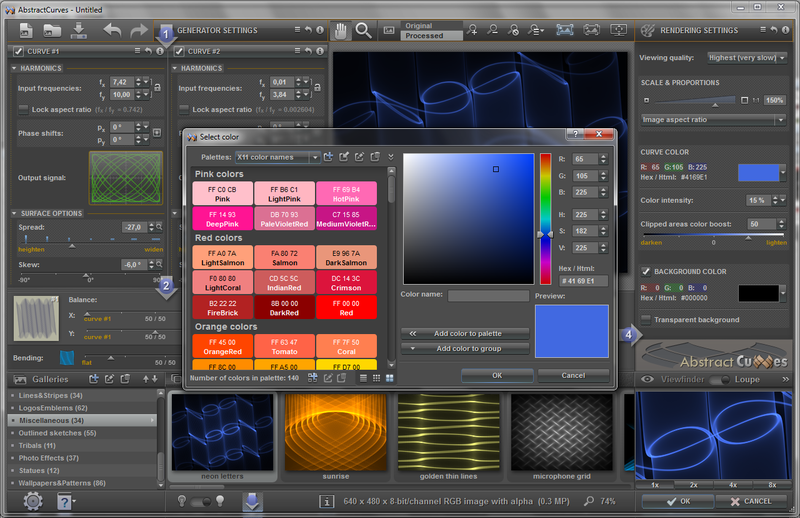 This allows for GIMP to run 32-bit Photoshop 8bf plug-ins. Unzip the file into the GIMP install folder (the .zip file has the full file structure to put PSPI into the plug-ins folder. Create a folder someplace to store the plug-in separate from the standard. If you want to run more than one 8bf plug-in, I would suggest separate folders for each one. Run the installer for Abstract Curves and select the 32-bit install. On the screen that asks you where to install the software, click on the "Add Hosts" button in the lower left corner of the window. Then browse to the folder you just created and click "OK". Let everything install. On my system, "acplugin32.dll" actually install to my C: drive's root folder. Move "acplugin32.dll" to the same folder as the 8bf file. Open GIMP and select "Filters" from the top menu. You will have a new option called "Photoshop Plug-in Settings". Click that and click on the "paper" (i.e. New) icon. Then click on the folder "browse" icon at the far right. Go to the folder you put the Abstract Curves plug-in at and click "Ok". Restart GIMP and either start a new project or open a current project. 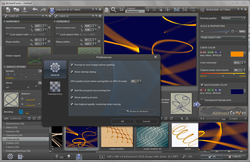 You will be able to access Abstract Curves from the "Filter" menu options. I got 1.1 from an earlier GOTD - really nice for desktop backgrounds. Any revision history on what is new?? Couldn't really find it on their web site. I got 1.1 from an earlier GOTD - really nice for desktop backgrounds. Any revision history on what is new?? Couldn't really find it on their web site. Barcud Revnik, If your earlier GOTD was installed on August 3, 2015 ( https://www.giveawayoftheday.com/abstractcurves-1-1/ ), it was version 1.179 x32. No noticeable improvement in this one except the support for 64bit, which makes it faster. If it was installed on January 2, 2016 ( https://www.giveawayoftheday.com/abstract-curves-1-1-2/ ) it was already version 1.190 with 64bit option, no need to reinstall if it is still working. Barcud Revnik, If your earlier GOTD was installed on August 3, 2015 ( https://www.giveawayoftheday.com/abstractcurves-1-1/ ), it was version 1.179 x32. No noticeable improvement in this one except the support for 64bit, which makes it faster. If it was installed on January 2, 2016 ( https://www.giveawayoftheday.com/abstract-curves-1-1-2/ ) it was already version 1.190 with 64bit option, no need to reinstall if it is still working. Kind of fun, but can't deal with the real world pictures. Q: How do I use my own photographs or images within the program? A: They will get loaded in as a background layer. Use Open Image mode on the Splash Page to open your own images. They can either be ones you've already created in AbstractCurves or any supported file type. Important: To see them, you have to disable the Background Color check-box which is on the right side of the display about half way down the Renderings Settings panel next to the Step 4 arrow. ew, just found the following on their website Q: How do I use my own photographs or images within the program? A: They will get loaded in as a background layer. Use Open Image mode on the Splash Page to open your own images. They can either be ones you've already created in AbstractCurves or any supported file type. Important: To see them, you have to disable the Background Color check-box which is on the right side of the display about half way down the Renderings Settings panel next to the Step 4 arrow. I have a previous GAitD version, 1.179, which while I don't use it often is a cool thing and I'll certainly update. Quite techy (and I'm very techy) but you can make minor tweaks and get very impressive images. P.S. they say in their FAQ you can install over the top of an old version but that didn't work for me and I had to uninstall the old one (partly manually) to get the new version to work. you can extract the files from the setup.exe using 7-zip and just run it from there and it will use your old activation data! Or just copy the files over the top of your installed ones! JohnL, technically... you are quite techy you said... you can extract the files from the setup.exe using 7-zip and just run it from there and it will use your old activation data! Or just copy the files over the top of your installed ones! TK, I sorted it all out, but initially I did what they said, which was just run the installer and let it install over the top of the old one, which didn't go well and so I reported it. It wasn't hard to fix but the uninstaller for v179 didn't really remove it so I did that manually to get a known starting point (usual stuff, remove files, hack registry manually). Copying files over old ones only works if the new installer doesn't add anything to the registry (plus you'd need to register any new DLLs) and I saw no point in messing about, many other things to do. TK, I sorted it all out, but initially I did what they said, which was just run the installer and let it install over the top of the old one, which didn't go well and so I reported it. It wasn't hard to fix but the uninstaller for v179 didn't really remove it so I did that manually to get a known starting point (usual stuff, remove files, hack registry manually). Copying files over old ones only works if the new installer doesn't add anything to the registry (plus you'd need to register any new DLLs) and I saw no point in messing about, many other things to do. Did you have the 32 bit previously and chose the 64 bit this time? The installer will look for a previous 64 bit and install over that. I had the 32 bit and I do like it so thought I'd up it to the 64 bit since that is the system I run. Uninstalled the 32-bit with Revo Uninstaller running the advanced scan for leftovers. Just a suggestion. JohnL, Did you have the 32 bit previously and chose the 64 bit this time? The installer will look for a previous 64 bit and install over that. I had the 32 bit and I do like it so thought I'd up it to the 64 bit since that is the system I run. Uninstalled the 32-bit with Revo Uninstaller running the advanced scan for leftovers. Just a suggestion. I forgot to mention...Just be careful when clearing leftover registry items that you keep the items for the 64 bit! LisaP, I had both previously, but just installed the 64-bit this time. As i installed and activated it after uninstalling the previous version the registry entries weren't an issue. Have a older version from GOTD . Bring it out once and a while to play.